Do you ever have salty cravings but want something healthy? Here is the easiest recipe for your next appetizer table. 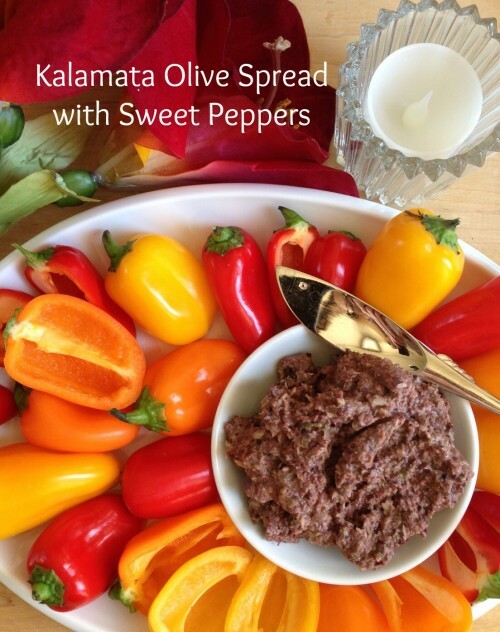 How can you go wrong with Kalamata olives for saltiness and for that crunch factor sweet mini peppers. Theses peppers are mild, not hot and perfect for dipping. With their scoop-like shape they make a great alternative to chips. You can stuff these little veggies with this dip or simply serve on a pretty platter. Who can resist eating from this rainbow? Find these peppers packaged in the vegetable section or near the pre-packaged salads. Melissa’s Produce kindly sent me these peppers. If produce is not readily available to you, Melissa’s will ship directly to you in the southern California area. Pictured are organic vegetables and fruit boxes to choose from. Check out their site for many more options and products. What makes a great dip? These two do - Kalamata Olives and Mini Peppers. This dish cannot get more festive than this. Enjoy the ease of this dish while attending to your big holiday meal. Place all the ingredients in a food processor or blender, and puree until smooth. Place in a small bowl and set aside. Cut peppers in half and remove seeds.Place on a large serving plate along with the spread. Spread can be made ahead and refrigerated. Anchovies can be substituted with 2 tablespoons kippersnacks or tuna. Note: I was not paid to write this post. The post is my recipe and my thoughts. Melissa’s Produce supplied me with these peppers.